Pitstone Windmill is a Grade II* listed windmill in England which is thought to date from the early 17th century. It stands in the north-east corner of a large field near the parish boundary of Ivinghoe and Pitstone in Buckinghamshire, and belongs today to the National Trust. It is thought to have been first built circa 1627 as this date is carved on part of the framework. This is the earliest date to be found on any windmill in the British Isles. It should be remembered that such a structure would have had to have frequent repairs made to it, so it is quite possible the mill predates 1627. For many hundreds of years grain grown in the two adjoining villages was ground at the mill into flour. In 1874 the mill was bought by Adelbert Wellington Brownlow Cust, 3rd Earl Brownlow who owned the nearby Ashridge Estate. He subsequently let it to a local farmer, who ran a successful milling business from the mill. In 1902 the mill was seriously damaged during an enormous gale, damaging it beyond the price of economic repair. Around 1922 the derelict ruined mill was bought from the Ashridge Estate by a farmer whose land was close to the mill. In 1937 he donated it to the National Trust. However, it was not until 1963 that a band of volunteers began to carry out renovations at their own expense. The mill appeared in an episode of The Champions titled The Invisible Man which was filmed in 1967. In 1970, after an interlude of 68 years, the mill once again ground corn. Today the windmill is open to the public on Summer Sunday afternoons. The design of the mill is what is known as a post mill. This means the whole superstructure of the mill rests on one main post. This post arises from ground level through brick and a foundation chamber; the post then acts as a pivot for the timber built structure above with the sails. Consequently, the upper section of the mill and sails could be turned towards the direction of the wind (reinforcements added in the 20th century now prevent the upper section from turning). The mill machinery in the upper rotating section was reached by a long flight of external steps. ^ Historic England. "The Windmill (1310208)". National Heritage List for England. Retrieved 5 April 2015. ^ "Windmills and Watermills as stars of TV and film". Windmill World. Retrieved 2008-07-19. 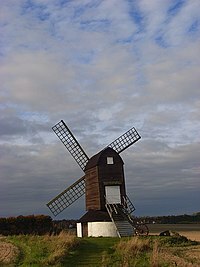 Wikimedia Commons has media related to Pitstone Windmill. This page was last edited on 4 December 2018, at 21:19 (UTC).